Early the following morning we jumped in a hire car with a local friend and headed for the Julian Alps. There aren't many things Australia doesn't have, but proper mountain ranges are one, and our drive through the Julian Alps proved to be one of the most breathtaking things I have seen in my life, helped of course by the great weather. Thousands of feet of Alpine beauty rose above us in a fashion that puts my considerable travels in New Zealand to shame. Along with this we were told of the horrific fighting that took place in the region in World War One. 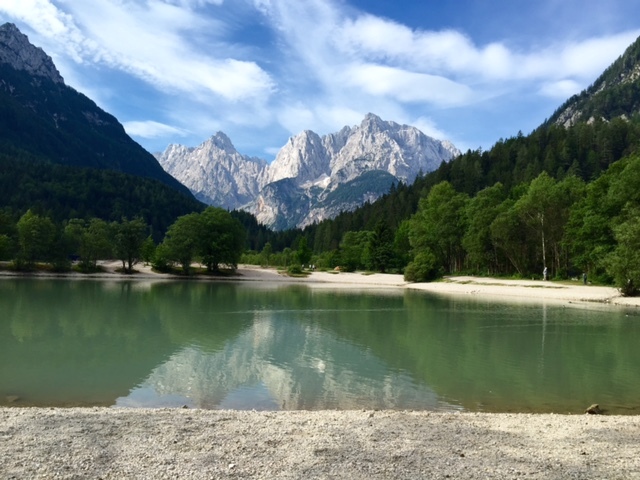 Lake Jasna at the foot of the Julian Alps. Photo by Jodie Lia. Eventually we arrived in Bovec where we were got our first adrenaline rush of the day, with a spot of white water rafting. 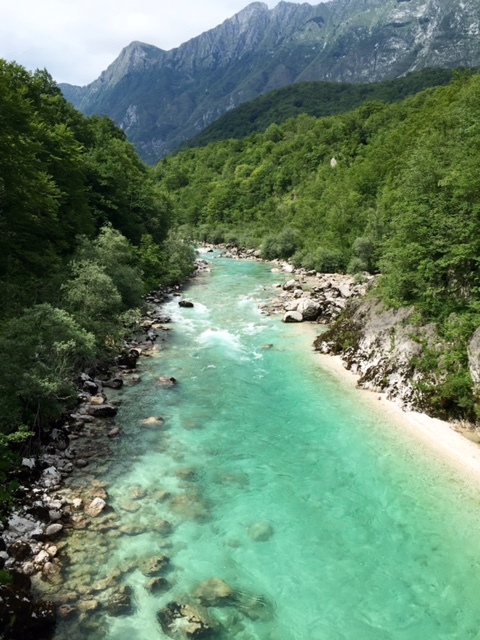 A great way to experience the Soča Valley, the views weren't the only thing to take my breath away, as I foolishly decided a dip in the 8 degree water was a good idea. Another amazing meal, local veal this time, before the final, and biggest thrill of the day, a spot of zip lining. After being fitted up with our gear we were packed into a few old 4WD’s by some particularly enthusiastic guides and we made away way well up into the mountains, where we given a simple but effective brief before clipping ourselves onto the first of 5 wires spanning the side of the valley that would take us back towards the show. 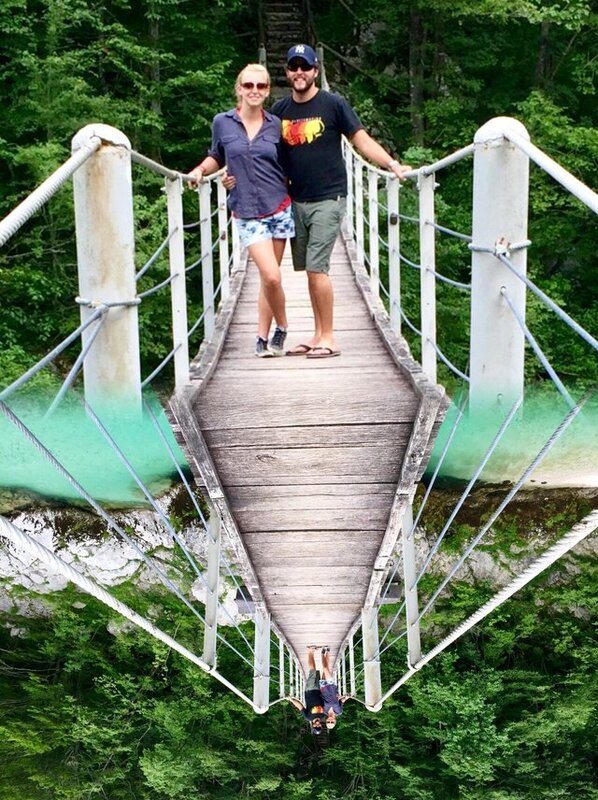 On a hanging bridge over Soča river. Photo by Jodie Lia. Now I have been Skydiving, Bungee Jumping, have jumped off a 192 m tower attached to nothing but a wire and am employed as a Helicopter Pilot, and I can unequivocally say that this is the best combination of scenery and adrenaline I have yet to experience. There are times in your life, I find, where it is impossible to take in everything your body is experiencing and truly appreciate it and this was one of those experiences. Zipping above the ground up to 100 m below you, the backdrop to which is one of the most visually arresting valleys I've seen, was an experience that cannot be described (despite my best attempts). And if the scenery doesn't get your heart racing, the fact that you are travelling at up to 60 kmh in nothing but a harness connected to two small pulleys that scream above you at 1000s of RPM certainly will. Just go do it. A great experience, in an amazing location, run by great people that have poured their soul (as well as litres upon litres of sweat) into creating it for us. So all that was left to do after I worked out how to use my legs again was duck into Italy for an hour or so (!!!!!) for some more amazing scenery before heading back to Ljubljana for one more tasty meal before our train to Zagreb in the morning. Our short stay in Slovenia really highlighted to me what I think its true strength is. Despite the fact that it is a small country, the breadth of experiences available is quite something, and after telling our friends of our time there it has jumped up all their lists of places to visit. I hope this is the case for you too, otherwise you are missing out! Soča river. Photo by Jodie Lia. Tagged adrenaline, daytrip, history, Ljubljana, river, Soča Valley. Bookmark the permalink.